Inbox is continuing to add features that users of classic Gmail have been used to their entire Gmail lives. It seems recently they added the ability to Show Original, which essentially gives Inbox users the ability to view the email headers. Until now users of Inbox needed to revert back to classic Gmail in order to view the headers. The process is simple, just click the overflow menu on the email and choose Show Original and you can see headers similar to those shown below. The addition of this feature will greatly assist users and Google Rising Stars and Top Contributors with troubleshooting any delivery issues that people may experience. 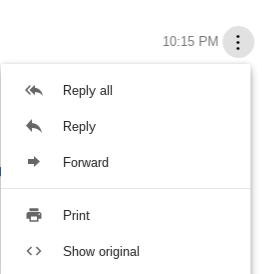 I know this is a welcome addition for many users and is a clear indication of Google's dedication to developing Inbox by Gmail further.